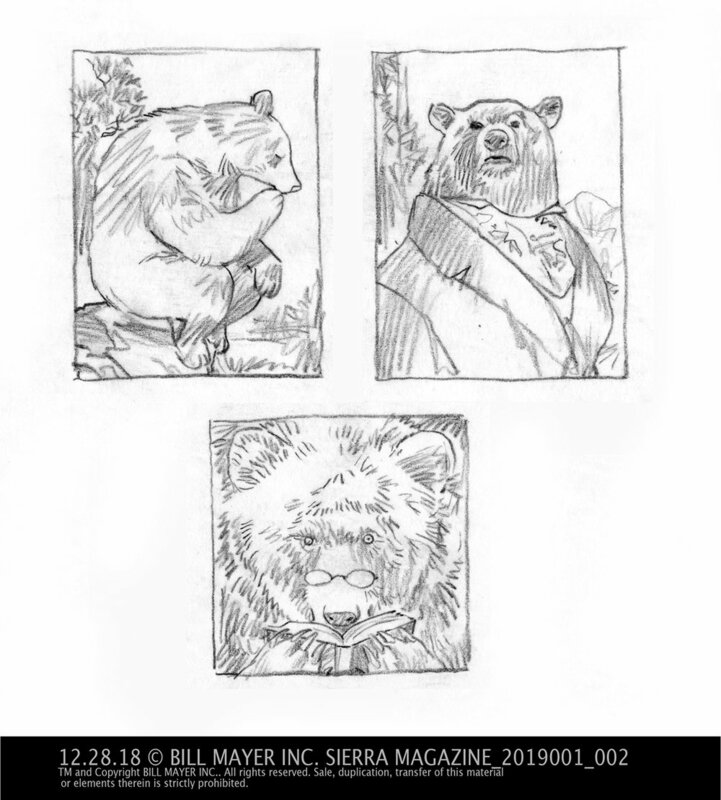 Sierra Magazine: Does a Bear Think in the Woods? 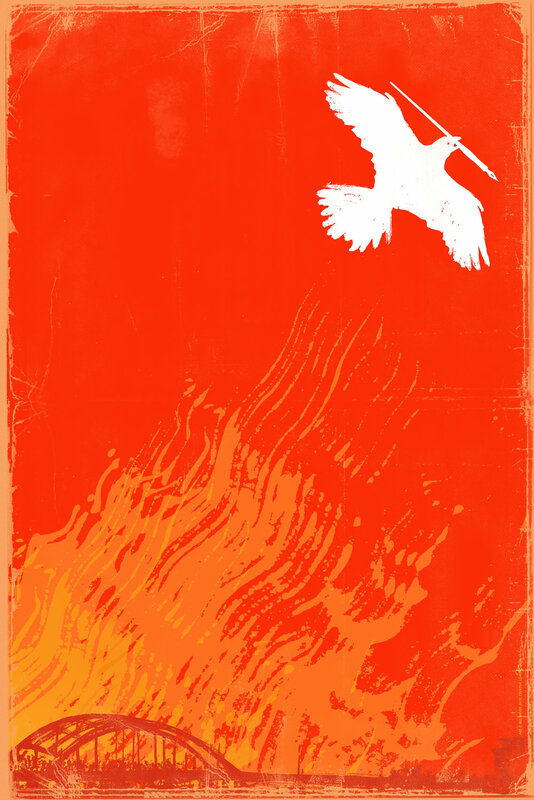 A great new project I recently did for Tracy Cox, supreme divine art director at Sierra Magazine, on animal cognition. Specifically, the author Brandon Kiem talks about Black bears and their keen intelligence. Read the article here! I have returned to looking a lot at Goyas work lately. In art school he was certainly one of my favorites. Forest had been searching around and we were looking at his series of dark paintings he painted on the walls of his house. (The Black Paintings) I guess that was why I decided to title these in Spanish. That and my new intern that was helping me name them is from Colombia.... It just felt like it fit. These four paintings; "El Diácono," "El Ministro Del Conocimiento," "El Vidente," and "La Cabra Beata," are done in gouache on watercolor paper. They’re part of an ongoing experiment with medium and composition and the potent nature of dreams. I believe color is really emotion. Color choices are made to reinforce those emotions. I think there are no deep, dark, hidden secrets. It’s just fun to play with the emotions art can generate. To me there’s a sense of poetry in the playful use of surreal elements. The inside spread without call out is going to get a whole lot more crowded when we add in the type and other elements. But for now in your face and in the gutter. I wanted this one to feel like that . wall in the New York Natural History room I call the Wall of Bio-diversity… It’s right next to the Blue Whale…. Thumbnails always start off in the same chaotic direction… So many ideas ,so many directions looking back at them alwys brings a smile and a thought of bringing another one to life. At the end of the week I caught a flight home to jump back on the cover and inside spread a bunch of call outs and spots……. In my first thumbnails I played around with some different ideas for how to design something really compelling in such a huge format. We went through several options but for the cover we stuck pretty close to Deb‘s original idea. One fairly ugly but endearing great white. Reminds me of one of my studio mates, Lenny…an eighty pound pitt Bull rescue pup who shows she loves you by putting your entire head in her mouth… Lovable but kind of scary at the same time. 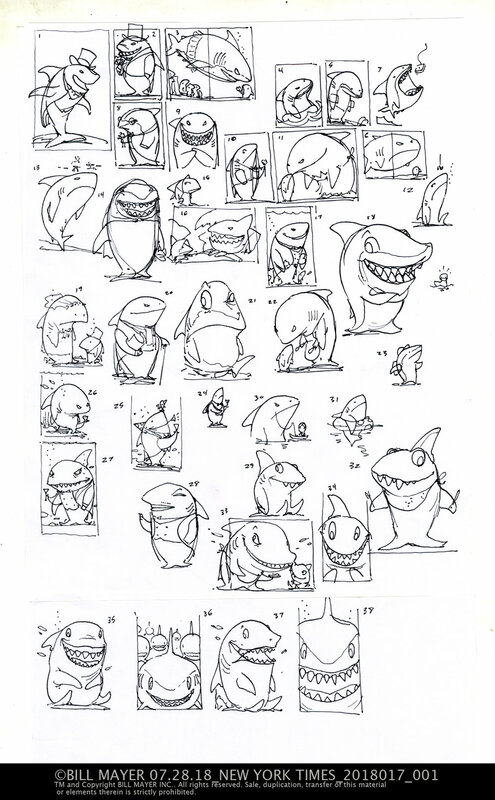 character sketches to get just the right hero shark. Tow different options for the spread…. The first “B”was a reveal that would make the cover shark appear on the inside but dwarfed by the “girl friend”We went with “A” the wall of sharks coming at you. tighter sketch on the approver spread….adding callouts This is primarily a science page and has to be extremely accurate. Teeth, Skin, Bones, Poop, they want it all…verifiable with reference. I fly back to the studio to get back on My shark friends… The easiest packing I have ever done. I don’t even take a toothbrush, everything is at home where I’m heading…The Week I am home to I am only there to work… I am on task make sure everything is completed and will reproduce well. They actually pull test proofs and we adjust the contrast and saturation so it reads as perfectly as it can…. While I am working I check in on Lee at the cottage… she has a cottage full there is laughing and shrieking form the background … Me I’m working and I’ll be back up soon. All of the illustrations go really well I am trying to leave time to make sure everything is tweaked out and that there is time for any concerns to be addressed.Originally I had planned to do all white sharks but they want to add some facts about several other sharks… The main idea behind the cover is that White sharks have been discovered to be much more social than originally thought. Interestingly enough they found this out through studying Sharks POOP. Kids are certainly going to like this part of the story… So definitely have to find a place for POOP. The week flies by and the work is fun and I have a late flight back to Toronto to finish out our vacation…We have a lot of festivities planned… and of course lots of fires to burn, cocktails to drink… another summer at Presquille’. There is a cocktail party and parade… A birthday party to celebrate the cottages Big 100. It was another great summer and White sharks made it even better. Can’t thank the folks at the times and Debora for making this job so much fun. Summers always come to an end and there’s a time to pack up and head back south… this year though we strap the canoe on the car and head north instead… sometimes you just don’t want to let summer end. One of my favorite Art Directors SooJin Buzelli called me about doing a new job for PLANSPONSOR, a simple one page Illustration. This was a very simple concept taken from one of the usual 50 or so thumbnails. I think the design on this spread worked so well and really played off the color in the sky. Some last minute scrambling to get it all tweaked right I added the northern lights to give the horizon a sort of mystical feeling. A very simple limited color palette to keep that starry evening feeling. Conceptually the advisor on the bottom is helping the client reach for the stars. Really a literal interpretation of the "Service Stars" line. Originally the figures were obscured by clouds, but in the final version I decided to nix the clouds to make the image read faster. This lower illustration was an after thought. A naive, graphic direction I thought of and presented as an alternate. It received warm reviews but we stayed on track with the original direction, which SooJin felt was more appropriate. Much thanks to SooJin and the folks at PLANSPONSOR. I got call from an old friend and fabulous art director BA Albert asking if I would do a quick turn around poster for the 50th anniversary of Martin Luther King’s murder. A local underground newspaper wanted to do a special promotional issue. They were going to print a letter our Senator John Lewis had recently written to MLK about what it had meant to him as a 16-year-old meeting with him, and how it had changed his life and path to the future. The wanted me to do a 24 x 36 poster that would be folded into the paper. It was Monday, and posters due Friday. Seemed tight, because I was in the middle of a large publishing project and that would have to be set aside to make room. It felt like something that needed to be done with the right tone and feeling. I had a short conference call with BA and Blake Tannery, the art director at ICON. pulled together some reference on JL, and MLK and started on thumbnails. There was a police photo from John Lewis's past that just struck me as such a strong photo. I always love the beginning of a job, conceptually somewhat open and direction not tied down. It’s just a visual stream of ideas that sometimes play off one another. Sometimes when I do a poster I add color to my thumbnails. It’s important perceptions that sometimes help things read. There were some great ideas. We hashed them out in a conference call and they suggested the possibility of doing a two-sided poster. I decided to do three of the posters. They loved the idea of the police photo but we all agreed it needed some conceptual element to make it work. Things didn’t really go that smoothly. I have a hard time with portraits and I must have started over four or five times, finally stayed late and got one that seemed to have the right feeling. The mug shot of John Lewis was painted in Gouache, the type at the bottom a combination of blown up digital print and bad Xerox copy. But I loved the weird way it distorted the type. My initial idea for the JL poster was to have flowers on his eyes like a nod back to those peace posters from the 60’s. I thought it was an ironic contrast with the stark police photo but Blake got some push back from CL saying “I’m getting everything from white appropriation with flower power to Day of the Dead. Geesh. ” Lee had already expressed some feeling that it was not the right approach so I quickly came up with a simpler solution making the reflections in the eyes into doves. Forest thought it made his eyes sparkle. A much better poster. In my initial thumbnails I had tried a cople of variations with hand written type that seemed problematic with my spelling and the time for editing nonexistant. The three posters were designed to have the letter included on the front in a column. The yellow poster to have the Letter on the back. I thought the yellow poster was by far the strongest direction. Much thanks to Creative loafing, the folks at ICON, my old friend BA and Blake Tannery. Much fun working with you guys.